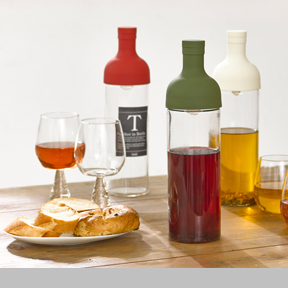 The Filter- In Bottle is a teapot with a wine-bottle-style that can be used to prepare cold-brewed tea and then pour it like wine to enjoy its aroma and flavor. The cold brewing method, which infuses the tea with water at a cooler temperature for a longer period of time, enables the tea to retain more vitamin C while preserving its mild yet rich flavor. Designed by Atsuko Sakamoto of HARIO Co. Ltd.